What is Bard Saga like? 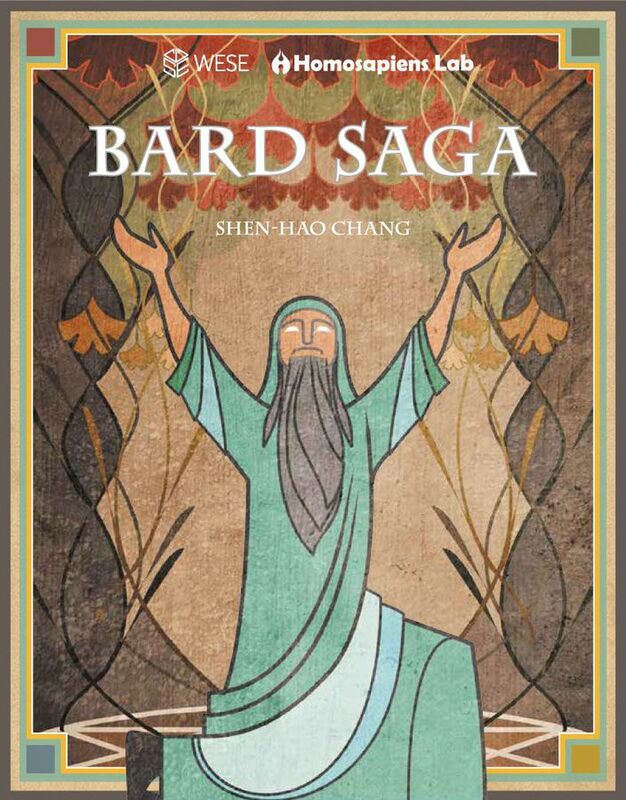 Bard Saga is a hand management and set collection game at its core. Each player starts with Story and Scroll cards to begin their search for Homer’s epic poem. In the center of the table lies the Field where the bards go to claim additional parts of the story. Every round the players take part in two different phases. The first phase, the “Seeking Story Phase,” players can either play story cards which allow them to use the card’s effect or play scroll cards to collect a story or legend card from the field. The field starts out with 9 overlapping piles of story cards in a diamond shape. Eight of the piles have a legend card at the bottom of the pile with the middle pile being the only exception. Once a story card is removed from the pile a new story card is revealed. In order to claim a story card from the field the player must turn-in scroll cards of the border colors of each card that overlaps with and including the story card they want to add to their hand from the field. For example, if the card the player wants has a yellow border and is touching two cards, one with a yellow border and the other with a red border, then they must turn in two yellow and one red scroll cards returning them to the Inn (the common pile). The same thing happens when players claim a legend card, except instead of collecting the legend card they place it face up and claim 2 victory points. Play continues clockwise until each player has passed. Once all players have passed the Singing Victory Phase begins. Starting with the first player who passed each player will collect one scroll of the same color as each story card they played that round and then one point for each story card that shared the same color as the most recently legend card to be claimed. 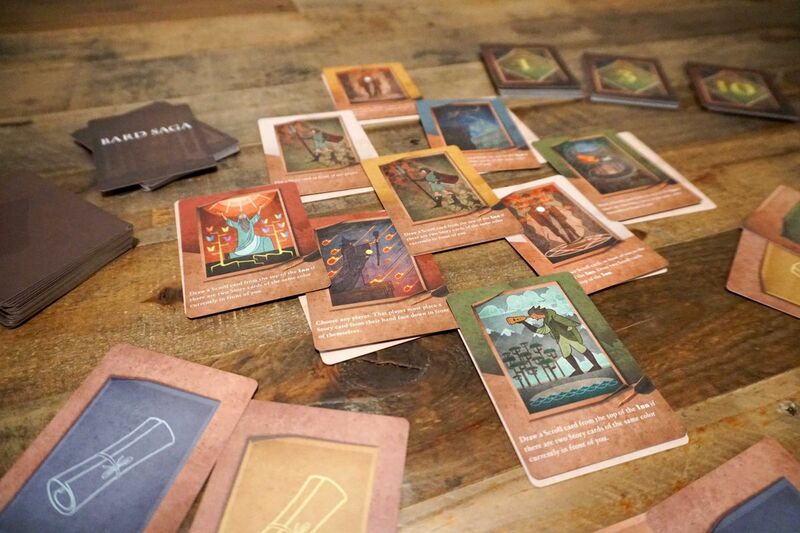 Players then discard any played story cards and draw three cards. If they had any cards remaining from the previous round they then must discard down to three cards. The next round begins with the first player to pass from the previous round. The game ends when the 8th and final legend card has been claimed. Bard Saga is a decent game that offers some good gameplay in a relatively short amount of time. While there isn’t anything that is revolutionary in its design or gameplay it does some things that I enjoyed. The best decision point in the game involves deciding when to pass out of the round. Being first player in the round can give you a big advantage in that round, but playing more story cards can be very important as well. When you are first player you get your scroll cards first and each scroll pile is limited so to ensure you get some of a specific color, you might need to pass early. Additionally the first player gets first choice on story cards to claim and since scroll cards are open knowledge you can sneak in and grab a card your opponent really wants, but that’s not all the first player gets to do. They also get to determine what color the white-bordered story cards count as for that round, which again, can be a very powerful choice. There are a couple aspects that people may not like including the take-that aspects of the story cards which directly change what cards your opponents have in front of them that round. It’s not a huge aspect of the game, but it definitely happens enough to cause some people to dislike it. Additionally, the randomness of the piles in the field can cause you to have little option but to pass for the round and watch the other players take their turns. When initially reading the rules the game seemed more difficult then it actually is, probably because of the translation, but also because of the terminology. There is the Market, the Field, and the Inn which all attempt to be thematic names, but in reality it just adds confusion as to which pile is which. After playing a couple rounds, though, the game was clear and simple to play.